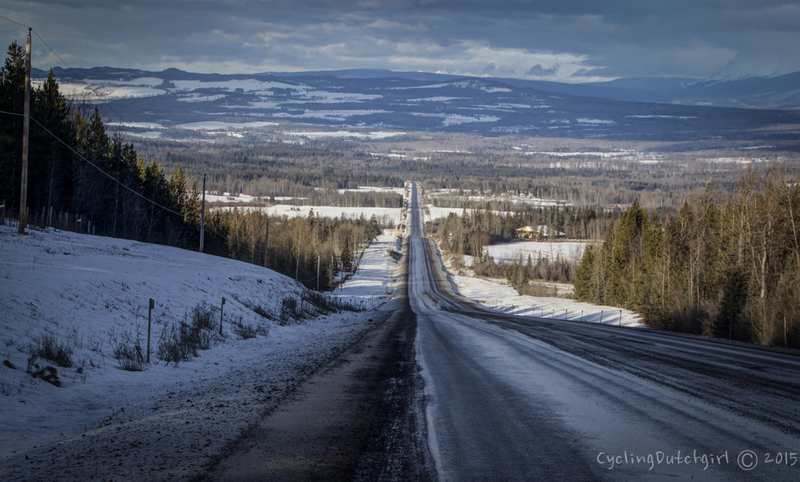 I was thinking how funny it is I went to Iceland to ride the ring road in winter and allowed myself 3 months. I’ve been in search of winter. 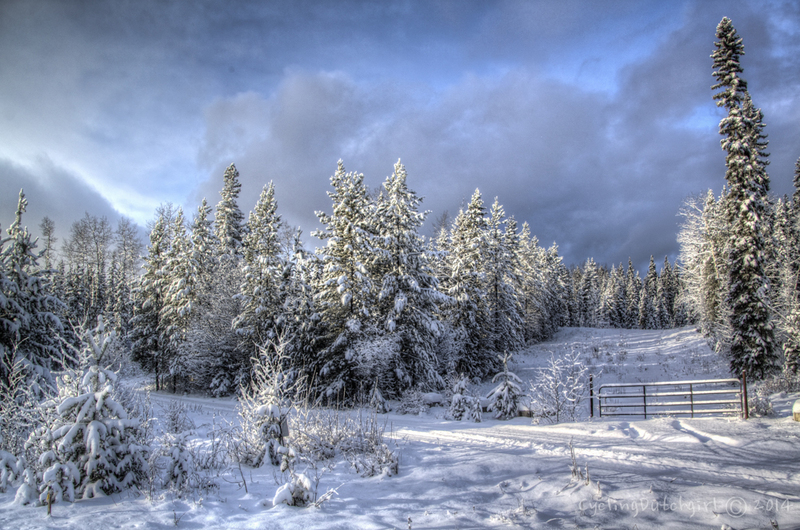 A cold clear wintery landscape is just stunning and magical. And I want to see how far I can push my comfort zone. Problem is the weather has just been pissy and wet for quite a while now. 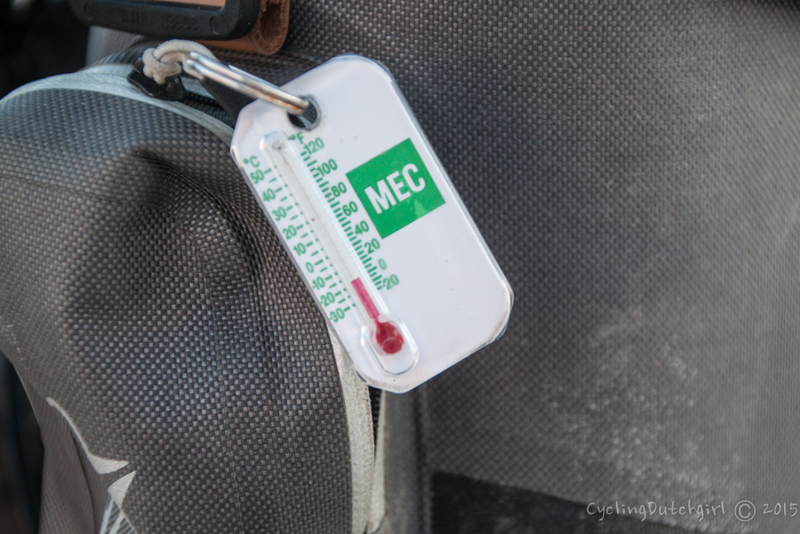 And for some time I thought my little thermometer was broke as it kept stuck at around 0°C. 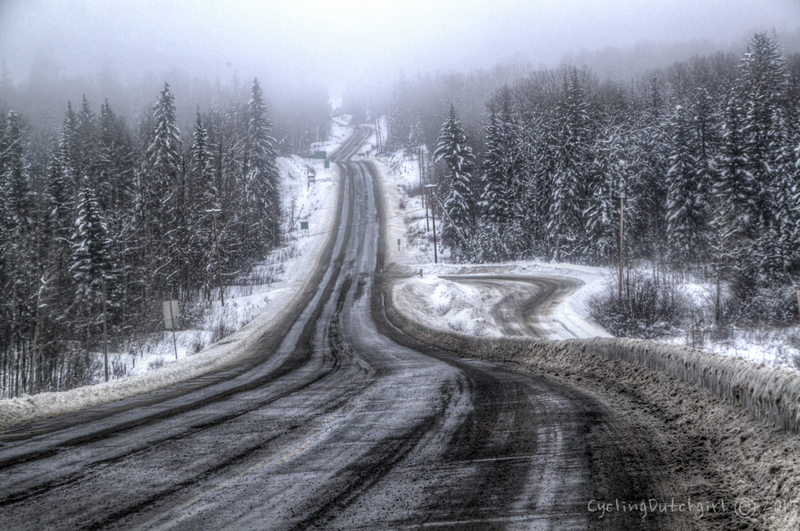 In those conditions the road turns to slush and a mixture of wet snow and salt get’s splattered all over you. Which really is no good for your hair. At the turnoff to Alaska I pulled over for a coffee and Monty happened to be there too. 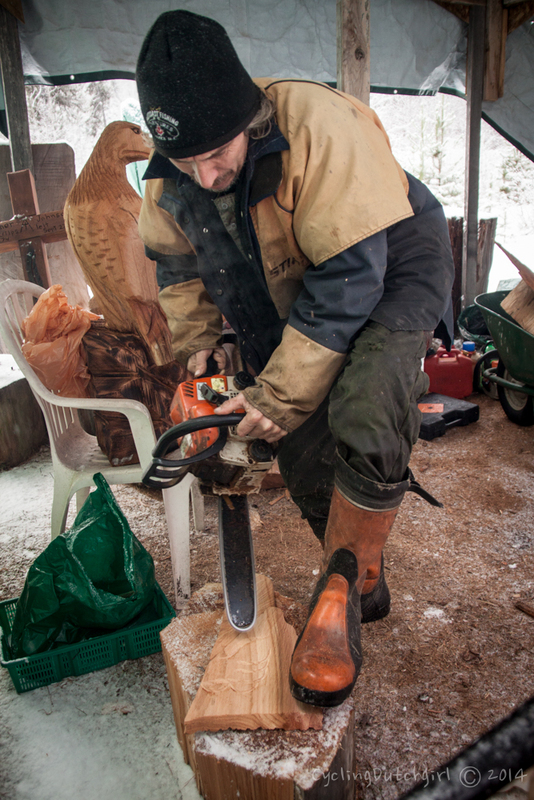 He told me about his work and the sculptures he carves with his chain saws. I should really come over and have a look at them, he said. So I wandered into the bush and he showed me some of his work which really is very impressive. He mentioned he’s heading to Germany this year to show off his skills and carved me a small eagle head that has been sitting in the back of my bike ever since. He then told me to go and see his mum in the next town. But I couldn’t find her. Instead I got talking to the Pole-family who just happened to get ready to see their girls perform in the annual skate-show. I haven’t seen that before. And it was a lovely performance and rather impressive. I loved skating when I was younger (still do I guess). But all them flips and jumps and twirls are a bit out of my range. 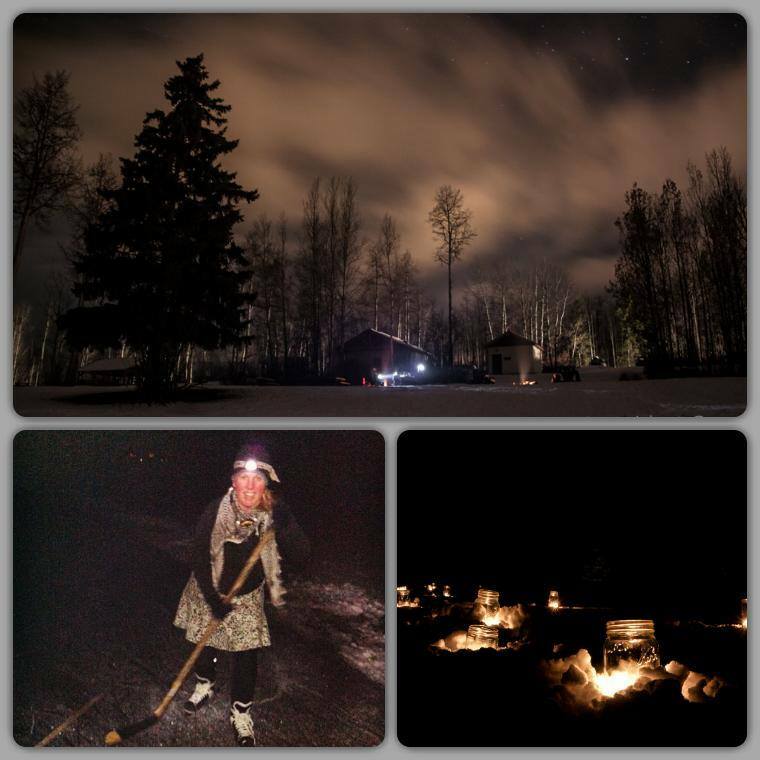 As the Pole’s lived in a gorgeous log home just out of the town I stayed warm and cosy and got up bright and early to head out of town in the direction of Smithers. 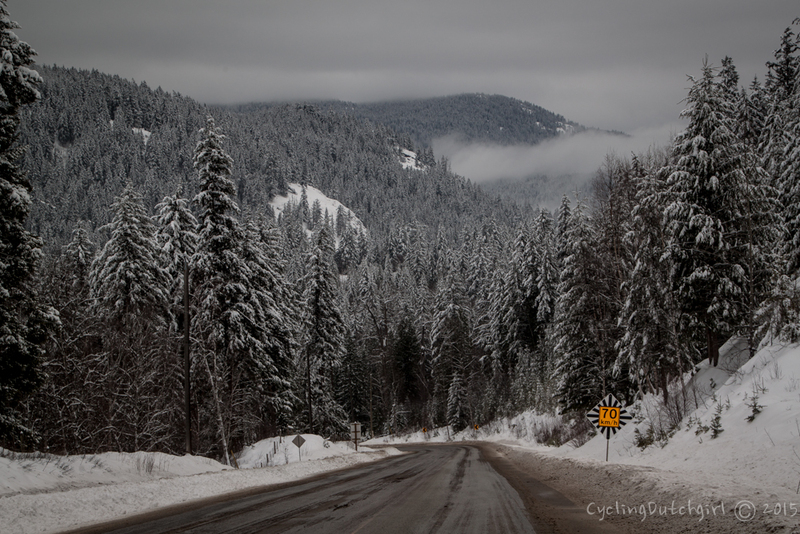 It has started to look slightly more wintery, the road was easy to ride and even my spikes didn’t slow me down too much. A minute later I saw two Moose. Another first. It was about coffee-time when I rolled into Smithers. And in a small restaurant I got chatting to some friendly folk and was put on the phone with the major. He likes riding bicycles too. When I left a lady had paid for my soup and a gentleman for my coffee. The hospitality and friendly people are really overwhelming at times. Everybody was already in the Christmas spirit and I stayed a warm and cosy couple nights at Deirdre’s home. 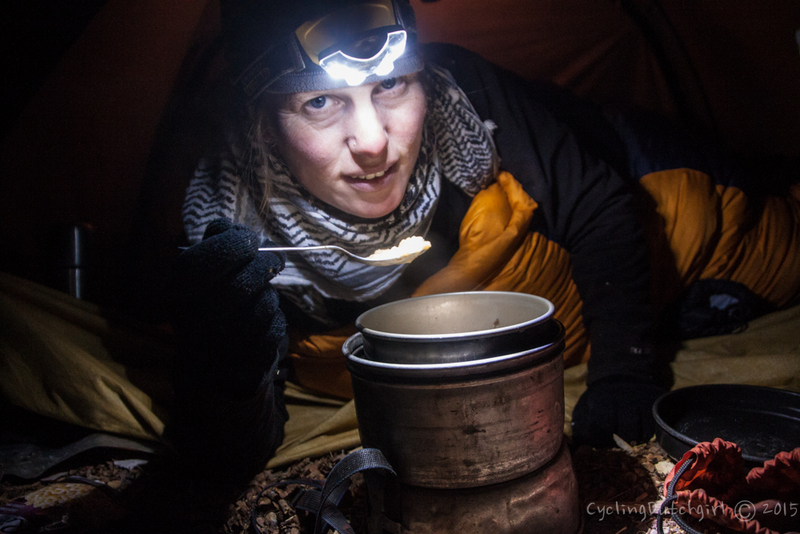 She’s no stranger to bicycle touring. And racing. And running. And skiing. And skating etc. 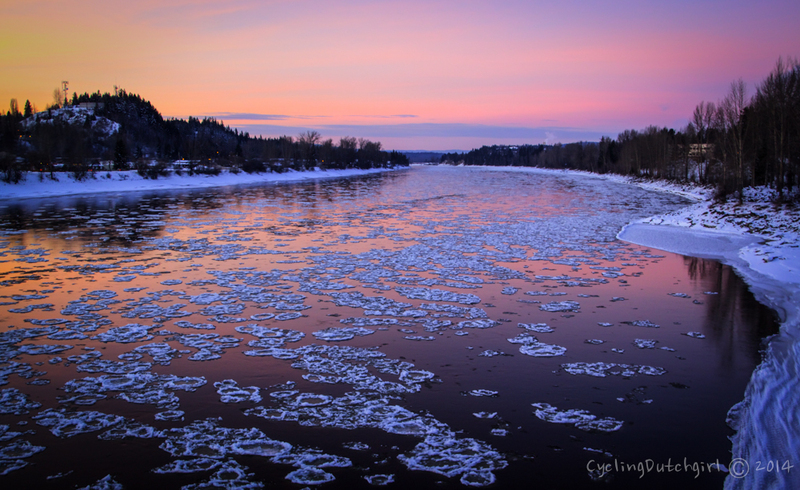 Since it was winter solstice we’d decided to head out on the ice that night, with a borrowed pair of skates I enjoyed the clear skies and the mild temperatures. I didn’t break anything (like bones or pride) ! And enjoyed coffee with Bailey’s and good company afterwards. I really like the small towns out here. I cheated by eating before starting the climb, so I wasn’t hungry at all. HA! Next small settlement was Houston where Keith found me. I pitched it on Burns Lake as it was nice and flat. Better not too light the campfire on the lake. It was a great little spot and the cracking of the ice was muffled by a fat layer of snow so that didn’t keep me up at all. It was finally getting a little colder. Now the slush froze and got stuck in my wheels. Keith had rung a friend who owned the Endeka Hotel just up the road. They were closed for the Christmas holidays but opened up just for me! 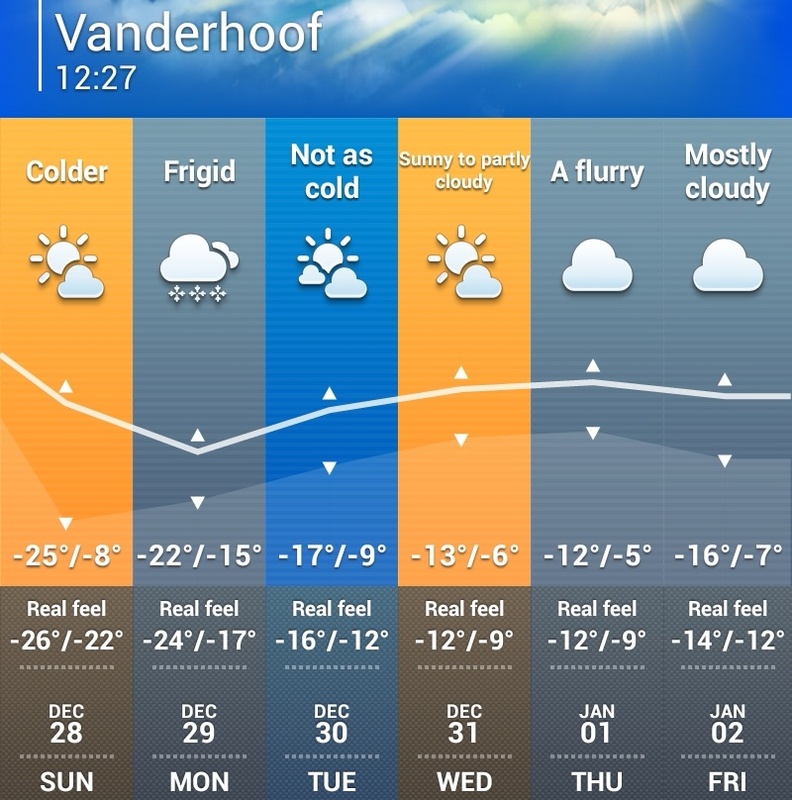 By the time I arrived in Vanderhoof the temperature really started to drop. As it happened my friend Deirdre was in town too. This is me catching up with her and her friends who are all keen cycling folk! When I left town I noticed the sign. well maybe a little bit. But in a very good and inspirational way. 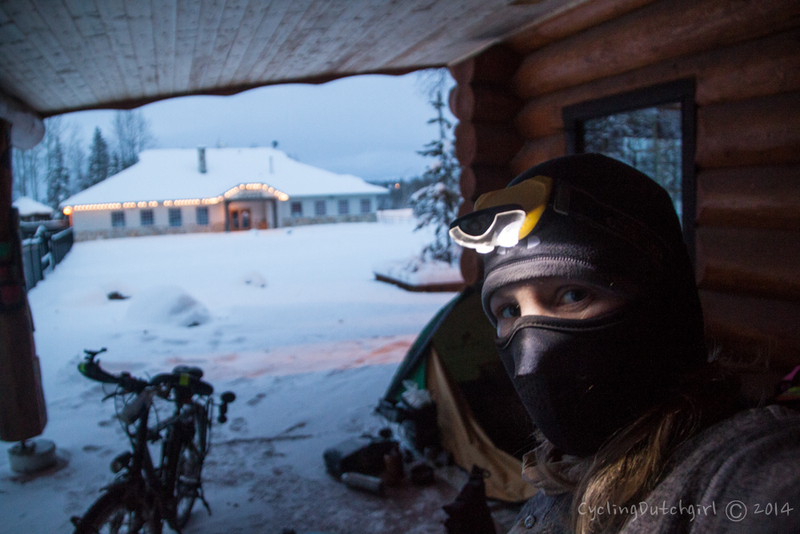 Jin, who’s just been riding all over Northern Russia and into Finland where she’s seen taken some superb Northern Lights photo’s! 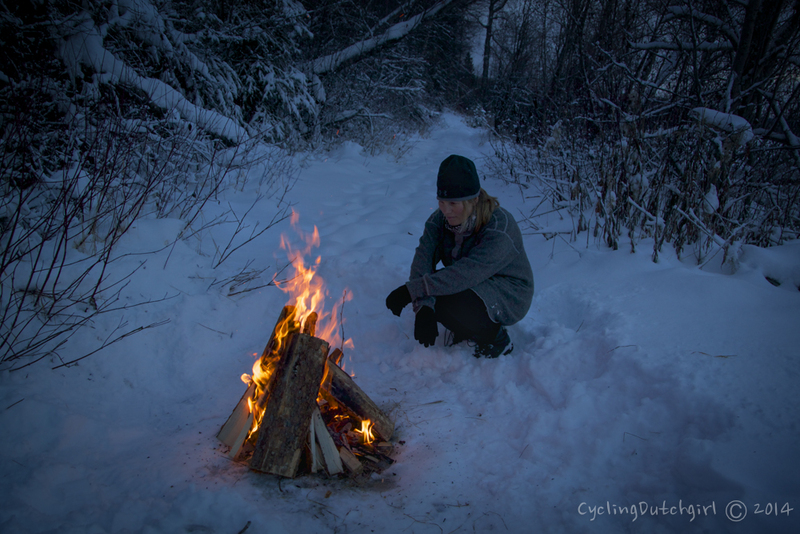 She Explains in her own wonderful way why she loves cycling in the winter. 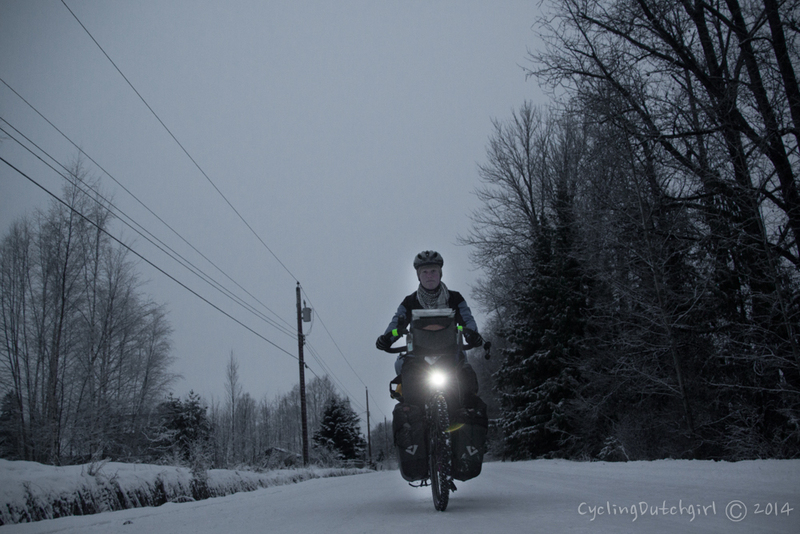 Sarah has just crossed Canada and dipped into the States (anybody asking for winter gear lists check her out) on her human-powered journey from London2London. 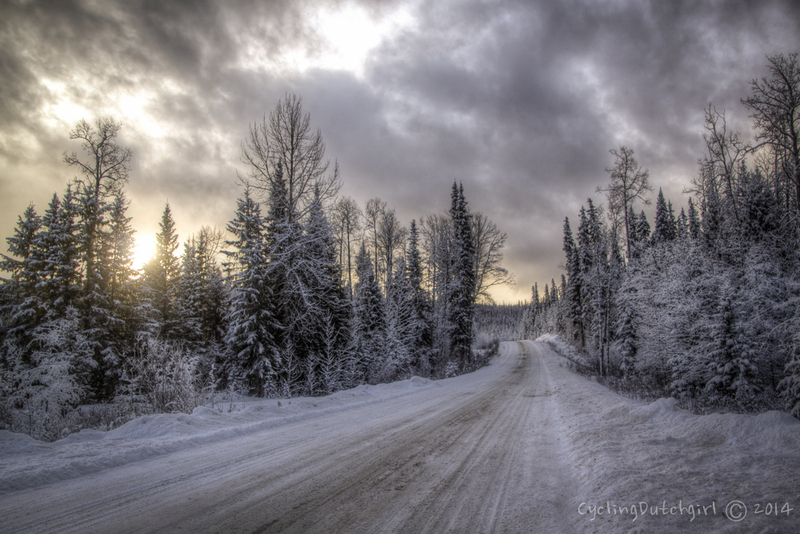 Emily, has just arrived in Alaska for the winter. The only worry I might have is other vehicles on the road. It’s still surprising that perfectly nice people get into a vehicle and turn into maniacs. There seemed to be a slightly higher density of maniacs around Prince George, but still nothing that would jeopardise my health. 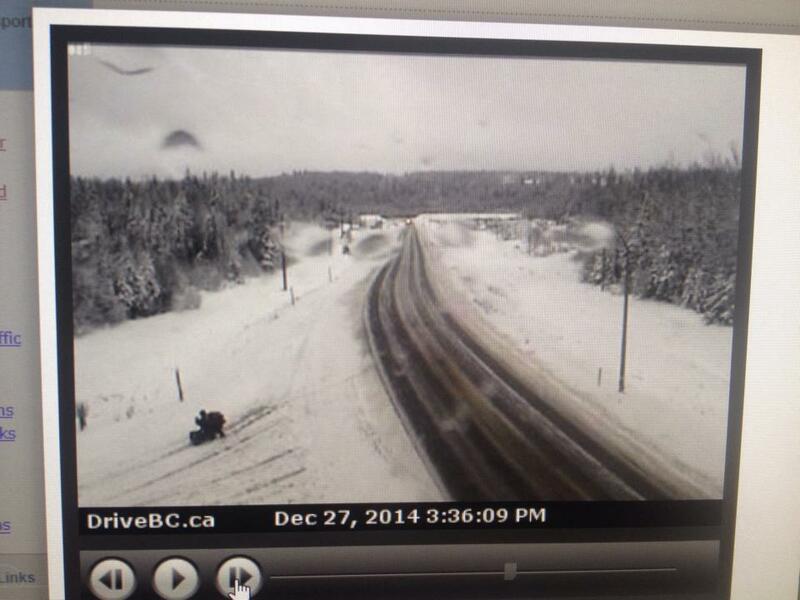 There are road camera’s along BC’s highways, so you can check the road conditions. And here the place I was pushing towards, to pitch my tent for the night. Nicely sheltered, a closed restaurant gave me a good place to camp. There was even a working powerpoint on the outside of the building! One evening I saw a small gazebo and decided to ask if I could camp there. I couldn’t because there was a whole big warm house with spare rooms and just two fellows living there. Not just that, they were about to cook up a huge Moose-steak dinner that tasted awesome! 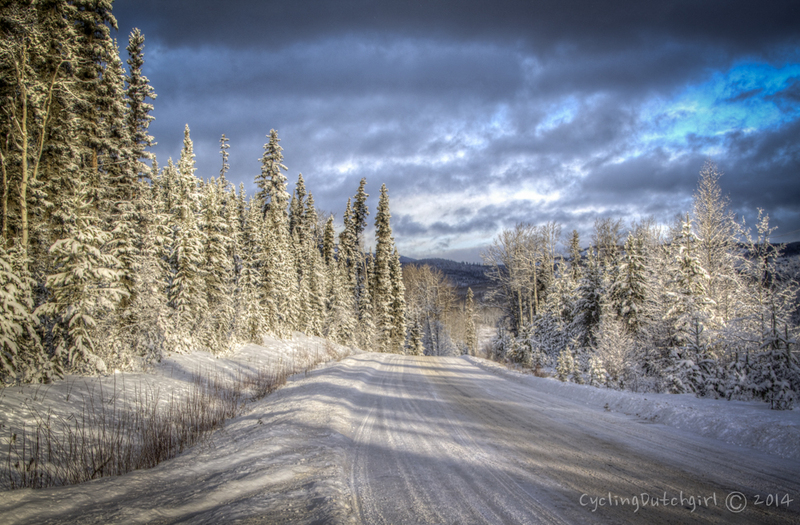 After a good rest I was ready to hit the icy roads once again and a slight turn in the weather made it a sunny blue skied cold day. I discovered my boots are not actually that good at keeping my feet warm, but you can always jump up and down for a while to warm them up again. Or find another cosy place to stay a night. 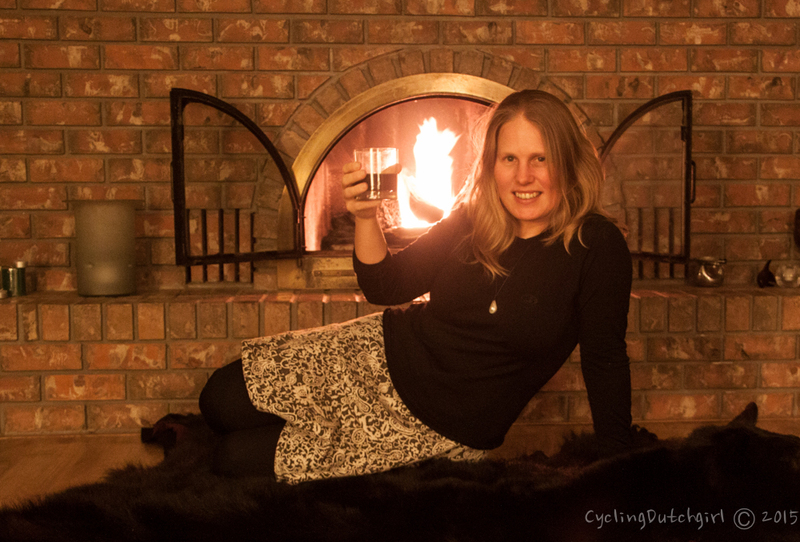 How more Cliché can you get then a glass of red wine on a bearskin-rug in front of the fire? This is Jim’s place. Jim couldn’t believe I hadn’t had a Turkey dinner for Christmas yet. He made sure I’d seen enough of Quesnel to warrant me wanting to return one day. For now it’s time to keep moving along. Back on the road and back into my tent. 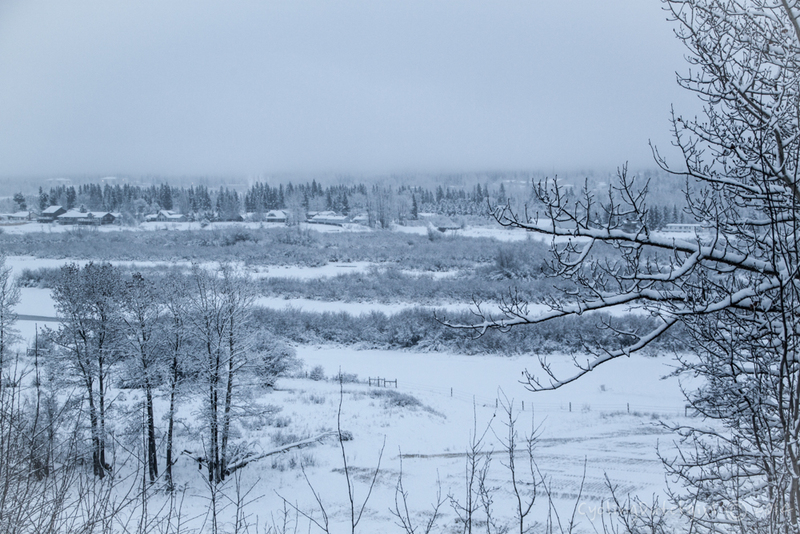 This time I found an empty wood shed on the side of the highway were I was very well sheltered from the snow. It had started falling and the forecast was storm for a few days coming. 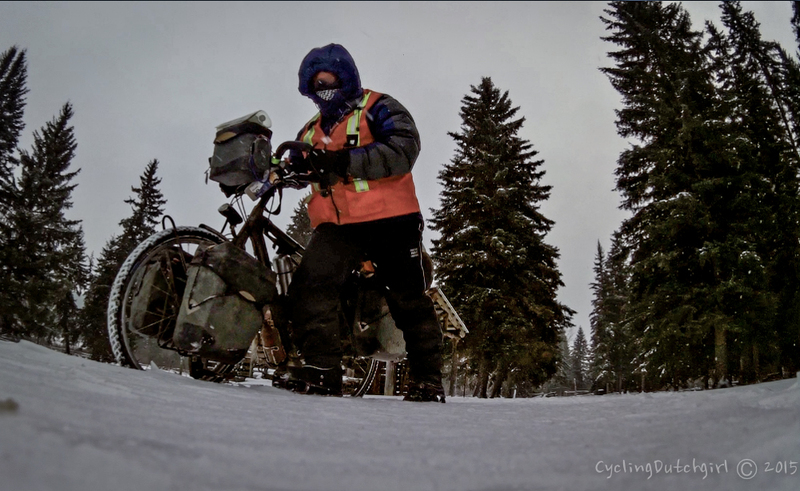 With visibility non-existent and no sign of better weather I pulled over at a small restaurant in 150 Mile House were Terry just happened to be collecting his mail. 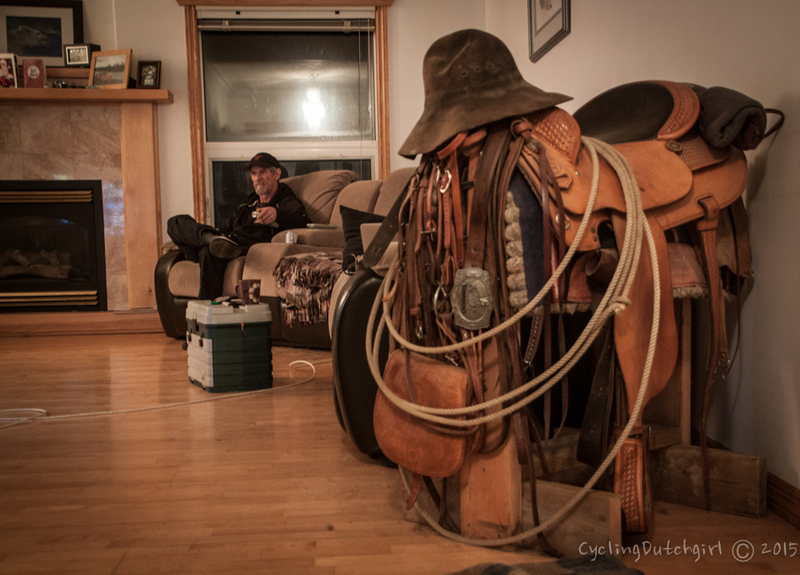 He lived only three km down the road and invited me to spent the storm at his place. 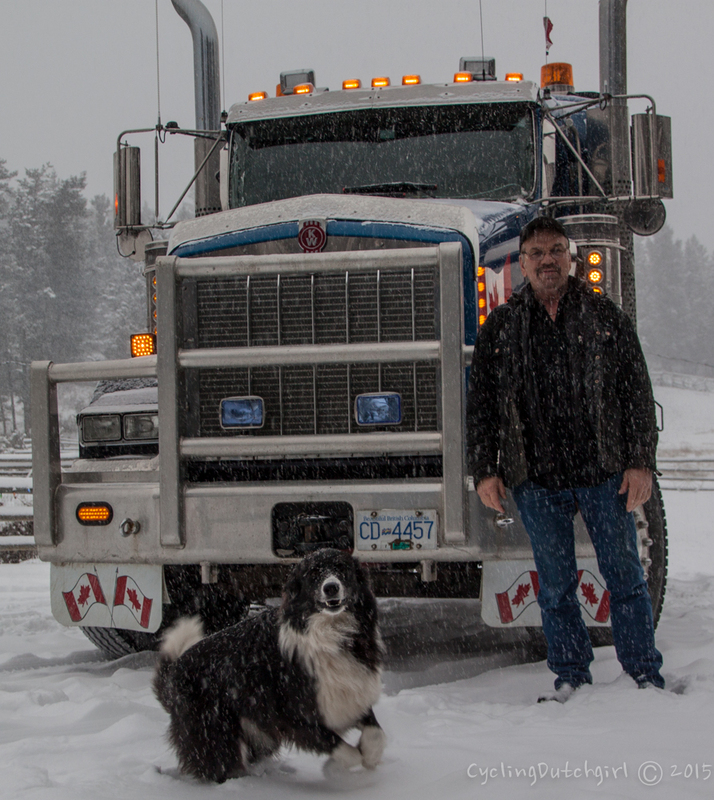 Together with dog Jake he has a comfortable home where I was happy to watch the snowfall, without riding in it. Without riding my bike that is. 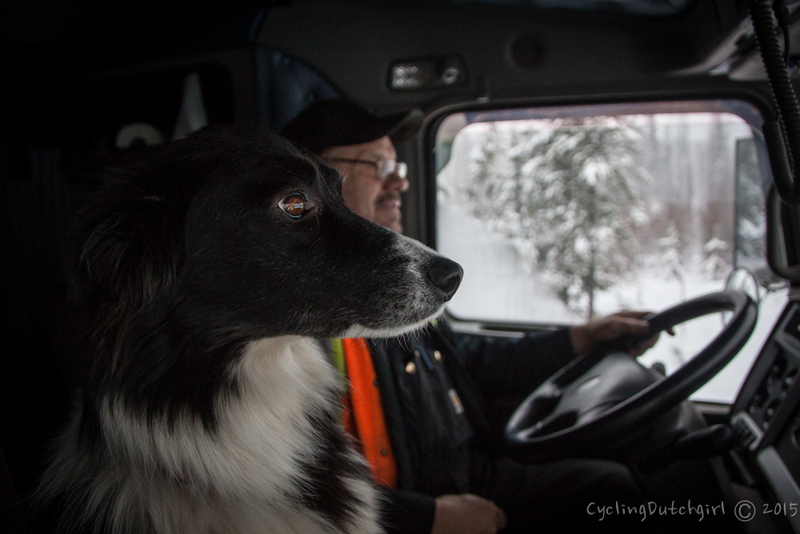 Terry drives a logging truck for a living, and Jake is always by his side. It’s interesting to see them from the other side of the fence for a change. And later, days after I left, I still have trucks pulling over and checking on me, seeing if things are going well. I was warned the road I intended to take was in a terrible condition. But it’s been one of the nicest stretches of the trip so far. 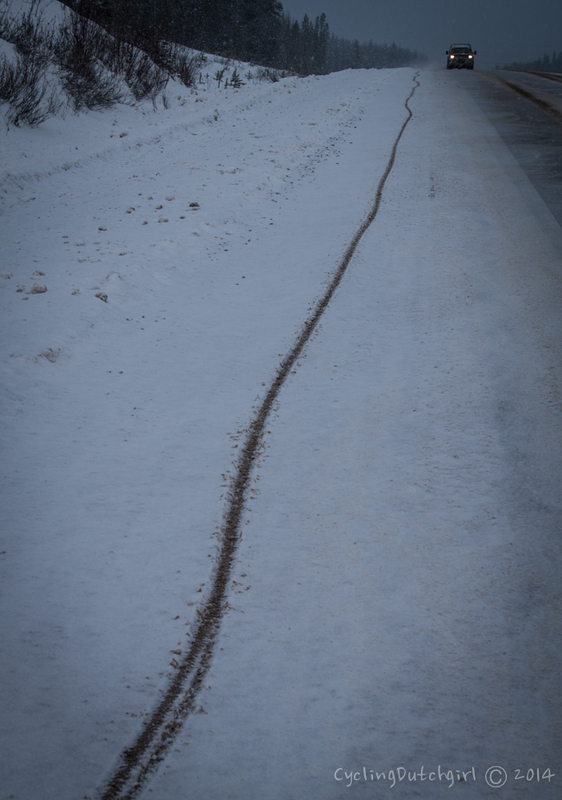 Sure it was icy in places and there was a bit of slush too. But on a bike you can pick your trail and finally being of the busy highways was just great! And I met Barry & Lois, they were just fuelling up when I stopped for a coffee and invited me to stay in their house 20 minutes (drive) up the road. And what hardship it was! 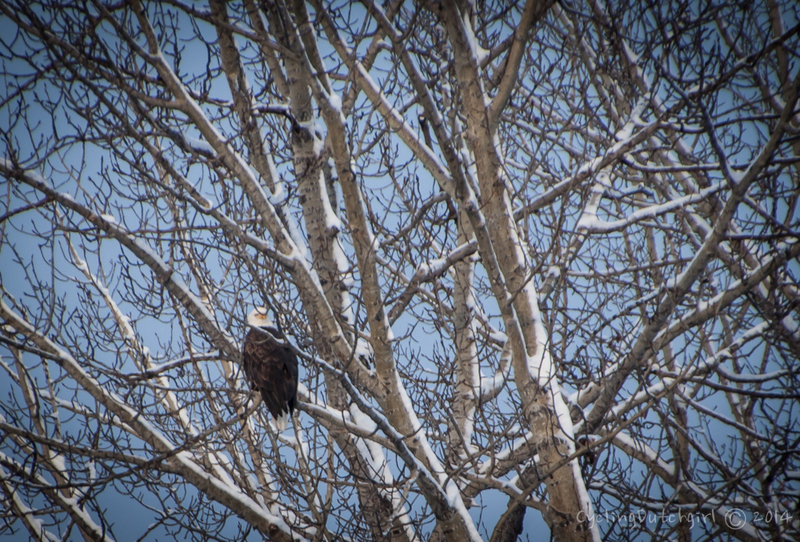 They live in the most gorgeous spot along the lake. Having travelled all over the world themselves it was a wonderful evening. 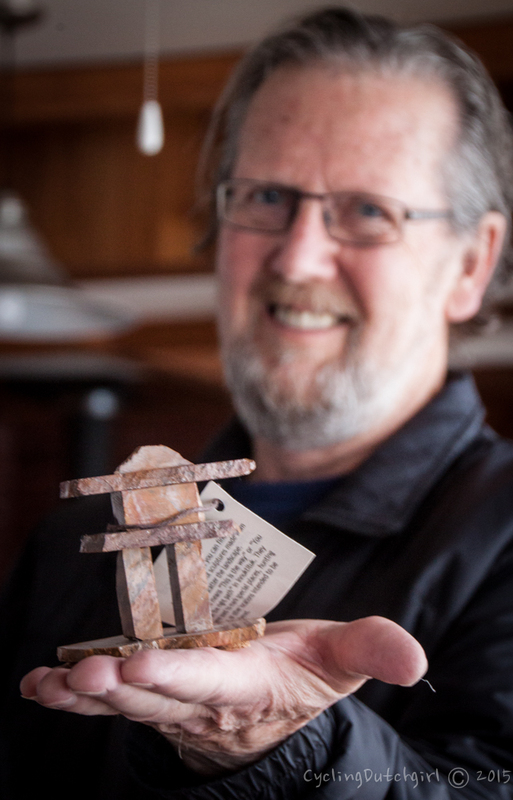 Upon leaving Barry gave me a little Inukshuk. These stone structures were used by the people’s of arctic regions to mark travel routes. 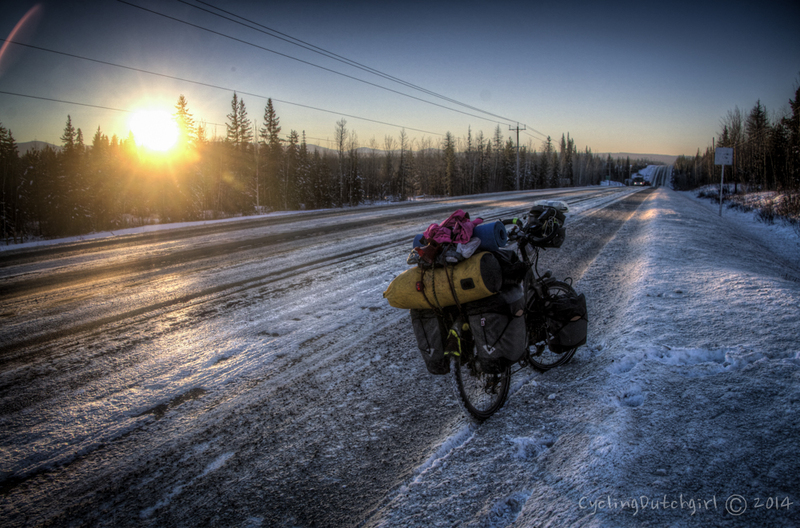 This entry was posted in Canada and tagged adventure, bicycle, cold, company, freedom, Friends, hospitality, inukshuk, travel. Bookmark the permalink. Always a pleasure to read about your adventures! Keep on going! Geweldige foto’s weer en dito verhalen. Inderdaad erg aardige mensen daarginds! You give us some fresh air with a happy sens of humor which brightened up our faces and warm us. 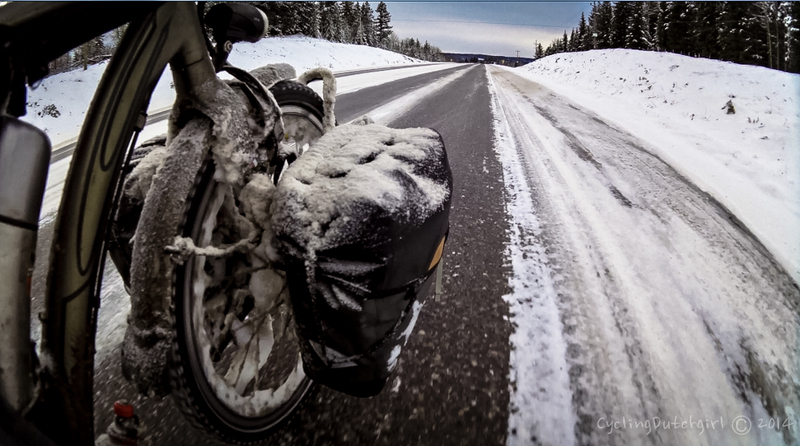 We also love mountain-travelling by bikes in winter and its peaceful atmosphere. Ontzettend mooie foto´s, wat een belevenissen weer! I love reading your posts and look forward to following your journey throughout 2015. Happy New Year and safe travels! 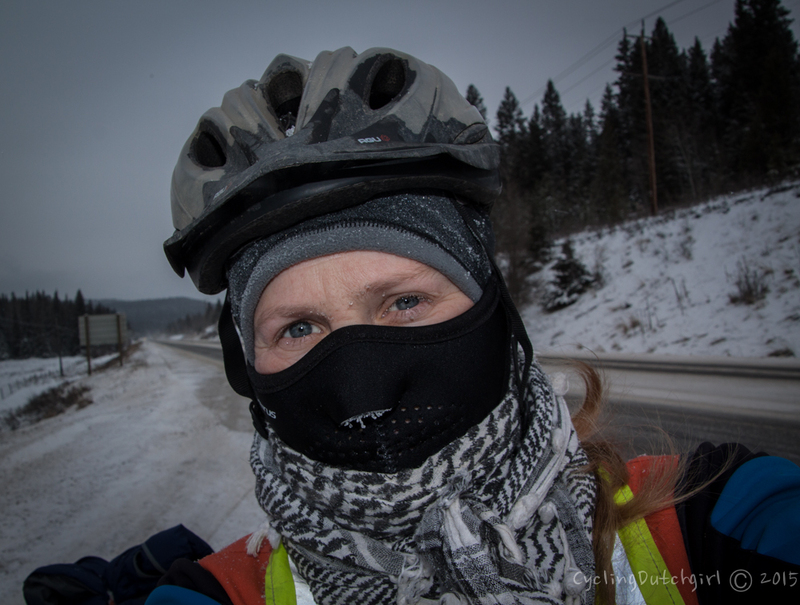 I have a goal to bike the ring road also. Although I was planning to do it in summer. How far were you able to go each day? I drove the ring road in 2011. And this past summer hiked the Laugevegur from Landmanalauger to Skogar. I am planning for a bike trip in Summer 2017 (it will be my 40th birthday!). Wow you’ve got some guts!! just love the blog, keep the posts coming, well done. Jealous! Done much Winter touring myself. I have cycled all the these highways and have never seen such hospitality. Hideous old men are threatening I guess. It’s assumed I’m a homeless tramp. I think you’re being polite about the drivers in Canada. I did all the mapping for Google StreetView in Northern BC if you’re using that resource-there aren’t really many options other than the main highways even in the summer months. Drop us a line if you get down to Victoria-we’re on Warmshowers! Another wonderful update. I’d say made up of equal parts of inspiring and daunting, but that would be to flatter myself. I so admire your pluck, but its way beyond me. Keep the reports coming and stay safe. As aways excellent Mirjam. Loving ur blog keep well and safe. 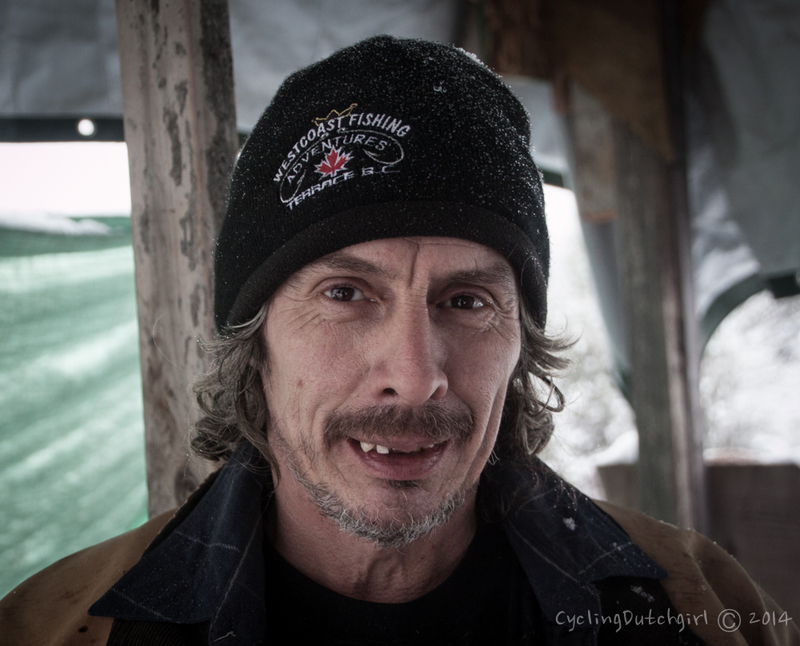 Enjoy the cold, but nice to see your still peddling along, me is sweating as usual. 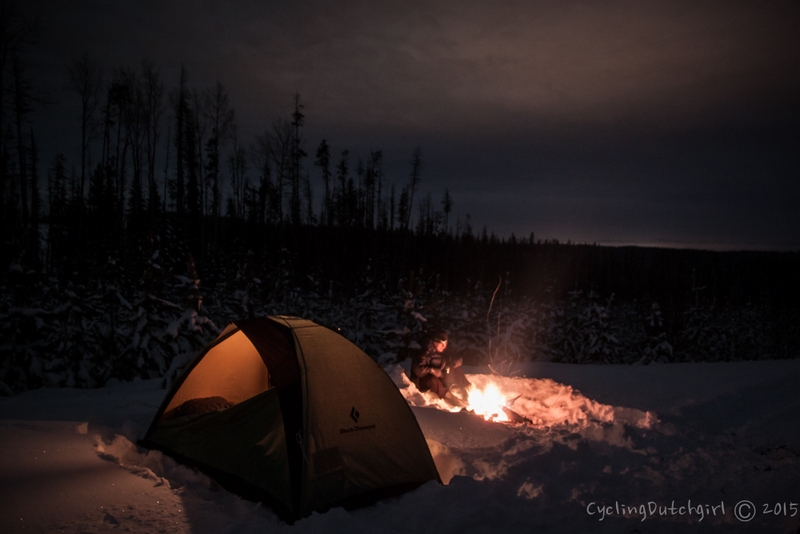 Reading of your winter adventures is the highlight of my season! You are in my thoughts. I hope your adventure and blog never ends! 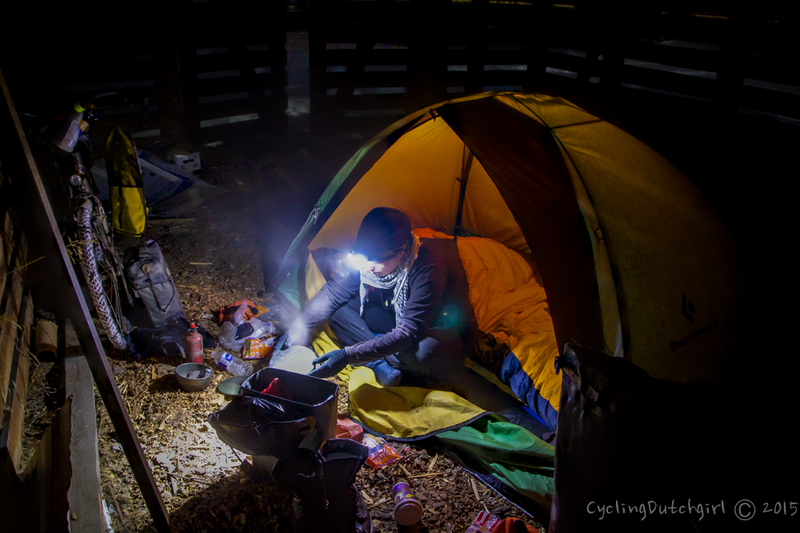 We used to travel by camper quite a bit and have met bikers along the way, but what you are doing is something else !!! Hi Mirjam hope you had a great Christmas and all the best for the new year. Sarah is about to walk the Canning stock route May this year for suicide awareness. I’m still plodding away at the port but both of us are hoping to go to UK to spend Chritmas with Sarahs family. 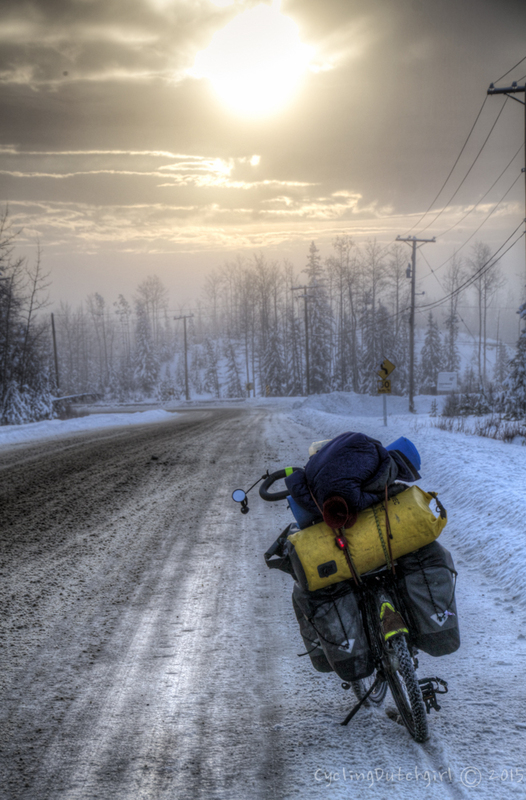 Is the bike fitted with plain or studded tyres. Hard to see by the photo’s. Have to say you are having a great time there, I wish you all the best. Hi just came across your blog – absolutely fascinating. What a brave person you are. May your route continue to let you meet friendly and generous people. Maybe one day you will consider touring Northern Ireland. All the best and good luck. You are a legend! Very inspiring read when I’m stuck in the office! Come to Ireland! 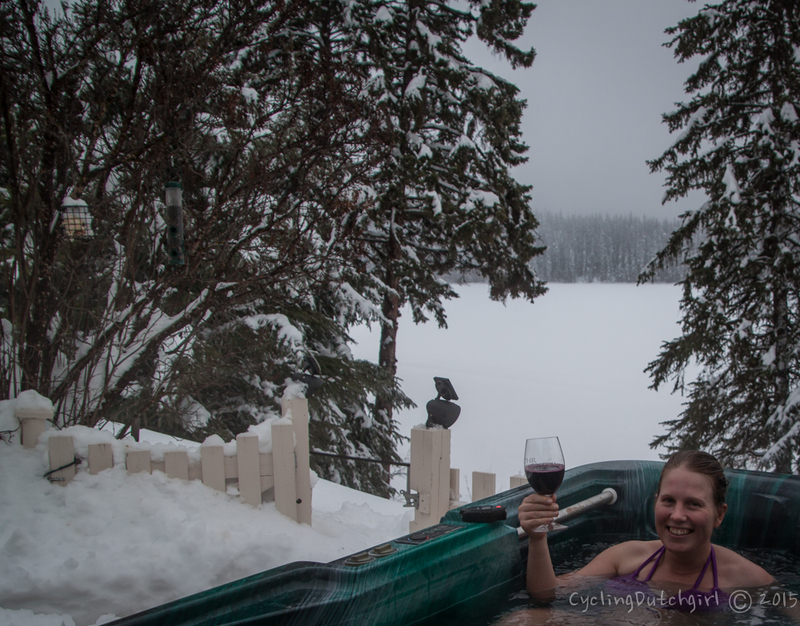 Your blog and cycling journey are amazing! I just came across your blog and found it so thrilling. May I ask if you had written somewhere about your gears on the road? Thanks so much! Hello! I fell upon your blog and I must say that I am very impressed! Your digital pictures are great, can I know what camera you were using? 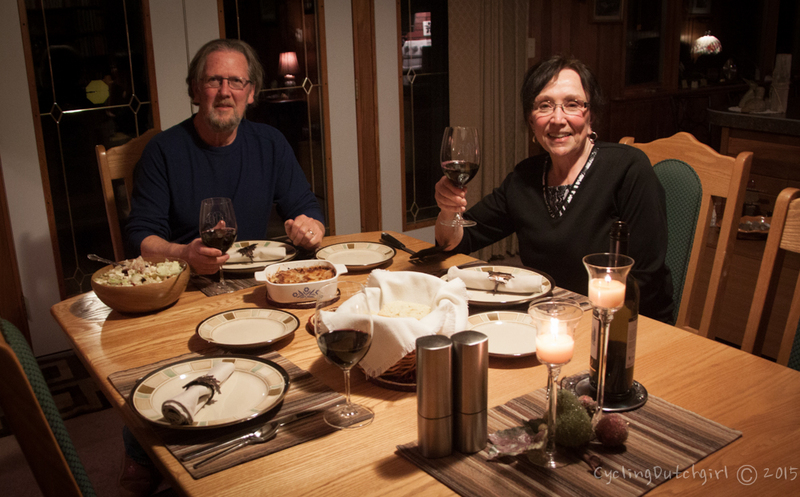 Your website was forwarded to me by Ray and Sonja whom you met in Princeton, BC. Ray is the nephew of my step-grandmother who I take care of and who is 104, so even though I have never met Ray, I keep in touch with him about her condition. 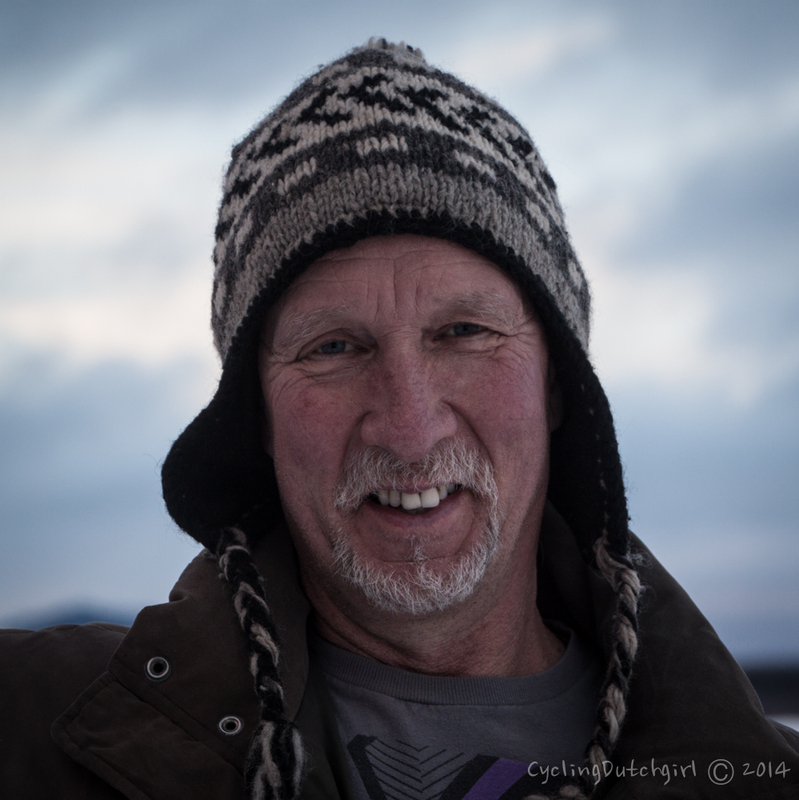 He forwarded your website to me because for the last ten years I have been leading self-contained trips for Adventure Cycling. 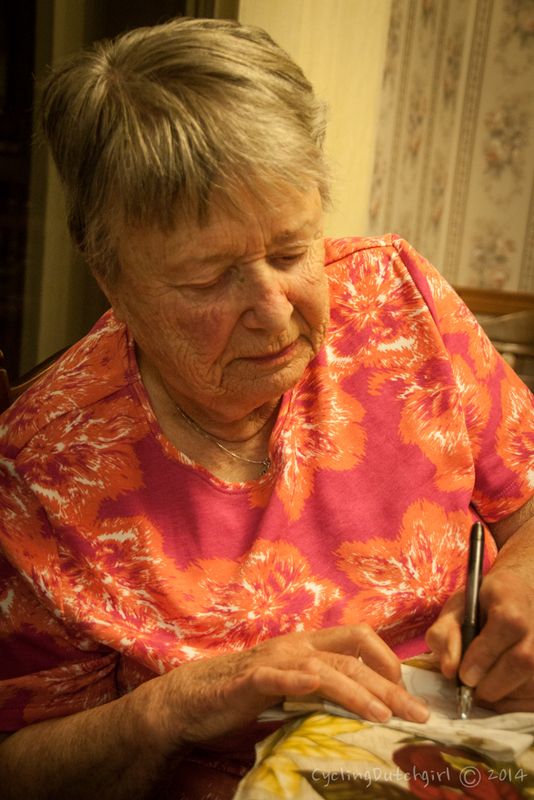 I wanted to invite you to stay with my husband and I when you start down the Pacific Coast. 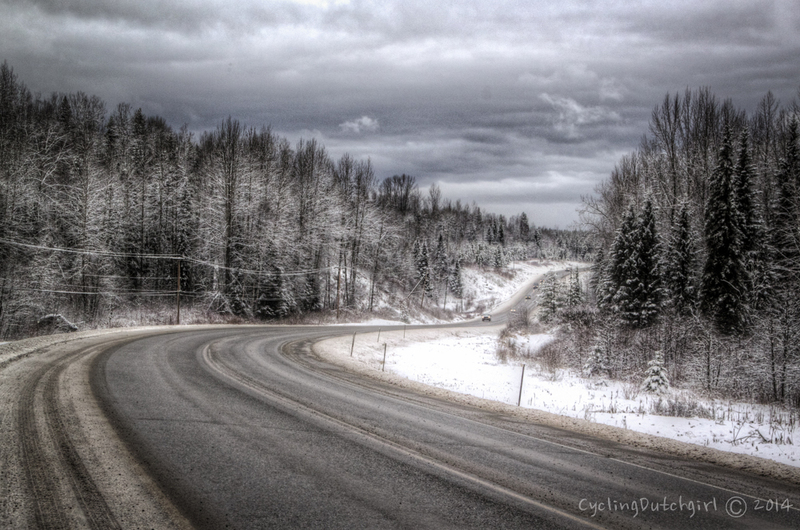 We live very close to the route and I have ridden it four times so may be able to help you. Last summer I spent two months riding where you are now. 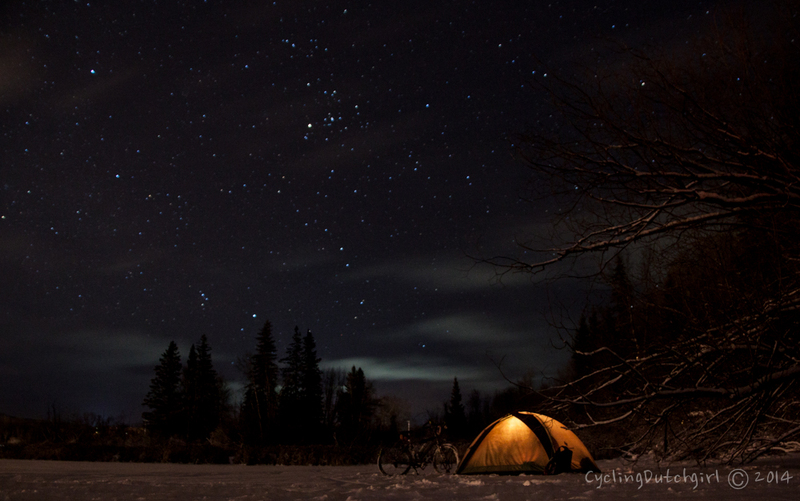 I am jealous that you are seeing all those gorgeous stars. It was daylight our entire trip!! And much warmer I might add. You are on quite an adventure!! Best of luck to you and please come see us. This is a great read. It’s long, but it’s worth it. aaah you’re so awesome as always!! This is incredible. 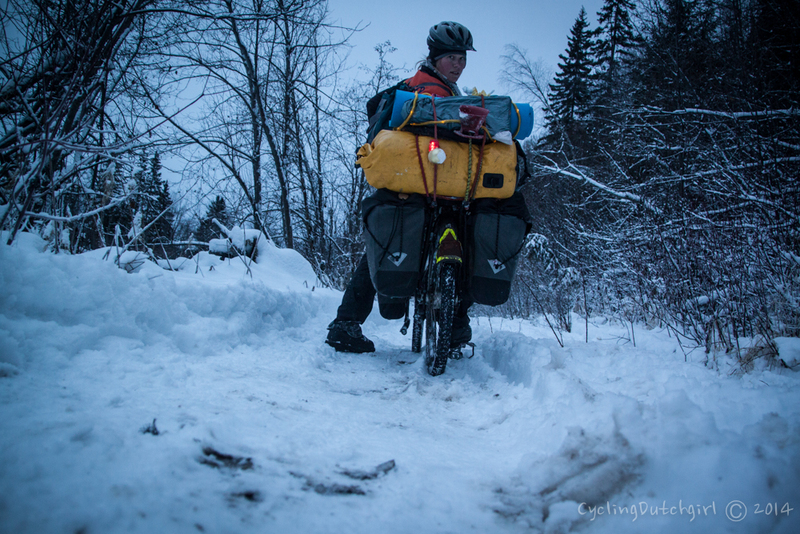 Massive respect for cycling in those harsh conditions. Your pictures are so beautiful! 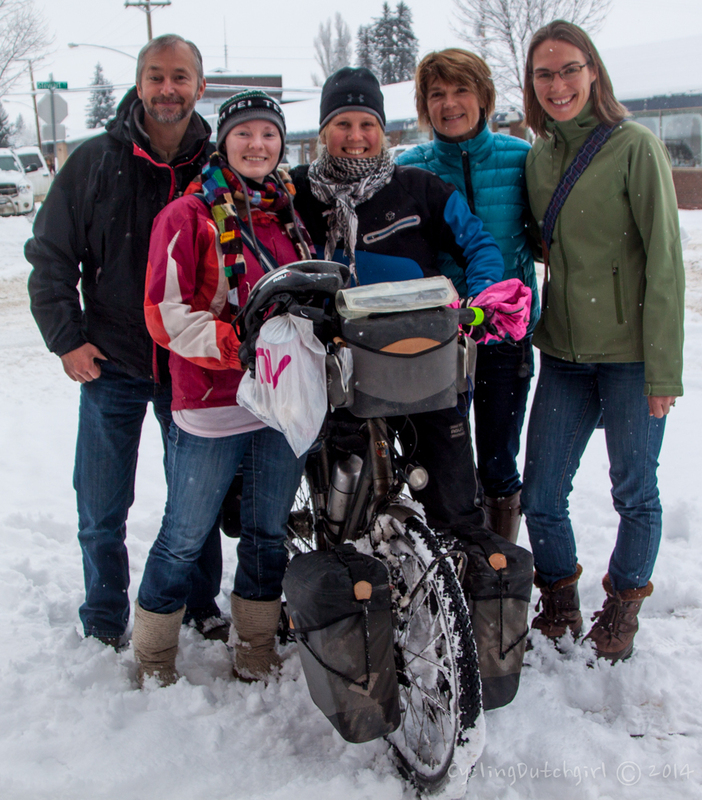 So much respect to you being brave enough to ride through Canada in their cold, I couldn’t even handle a full hour on the snowmobile in Saskatchewan! 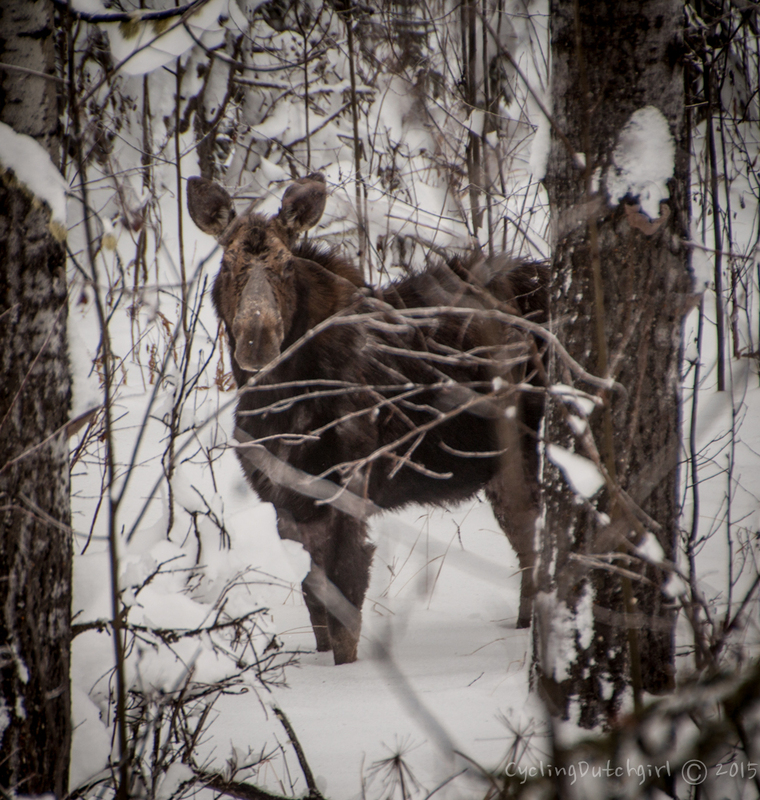 How close was that moose when you took the picture? 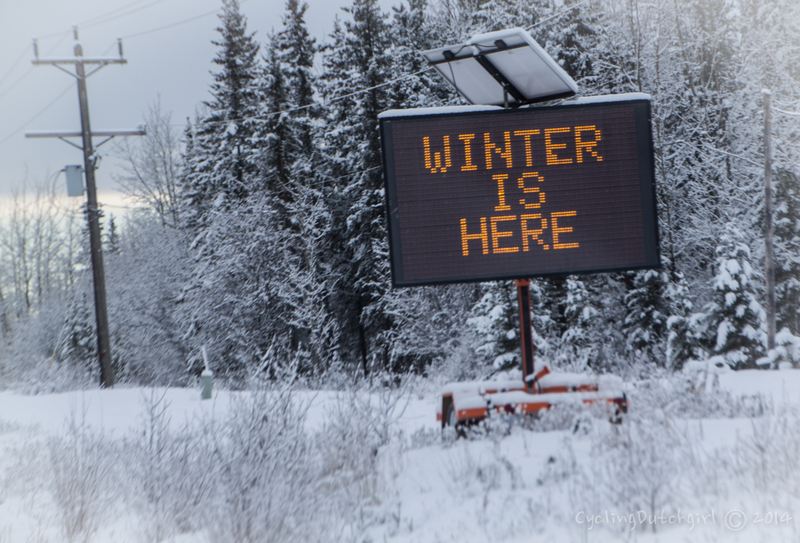 What an adventure… stay safe, have fun, keep going!